Circadian rhythms are endogenously generated recurring patterns of around 24 hours with well-established roles in physiology and behaviour. These circadian clocks are important in both the aetiology and treatment of various psychiatric and metabolic diseases. To maintain physiological homeostasis and optimal functioning, living life synchronised to these clocks is desirable; modern society, however, promotes a ‘24/7’ lifestyle where activity often occurs during the body’s ‘biological night’, resulting in mistimed sleep and circadian misalignment. This circadian desynchrony can increase the risk of disease and can also influence treatment response. Clinicians should be aware of the influence that circadian desynchrony can have on health and disease, in order to potentially develop new therapeutic strategies and to incorporate chronotherapeutics into current treatment strategies to enhance their utility. The entrainment of the circadian clock. The 24 hour solar cycle entrains the endogenous circadian rhythm to a period of exactly 24 hours. Interindividual differences in this phase of entrainment shaped by genotype, environment, gender and age lead to different chronotypes whereby an individual is more morning or evening orientated, falling somewhere on the scale from an extreme morning person ‘lark’ to an extreme evening person ‘owl’. For most of human history, environmental light was provided predominantly by natural sunlight, with dawn and dusk time varying little between successive days. In current times, however, modern technology promotes a 24/7 society where individuals can work, socialise, travel and sleep during the body's biological night, the phase of the circadian cycle during which the endogenous clock is promoting sleep. Humans experience daily social pressures and imperatives, and these may vary greatly from day to day (eg, between work and free days). Social obligations can affect the alignment of an individual’s behavioural cycle to the endogenous biological rhythm, through altered sleep and wake times on work and free days, resulting in circadian misalignment.23 24 This disruption may be temporary, as occurs with travel between time zones ‘jetlag’ or with society-wide changes to wake times via daylight savings time, or more permanent as with ongoing shift work. Night shift work, in particular, may result in profound circadian misalignment and many studies on shift workers have demonstrated the negative influence this can have on health.25 A milder, yet chronic, form of circadian misalignment is social jetlag (SJL). SJL is the daily and ongoing discrepancy between social time (when an individual's sleep and wake time is dictated by social or work obligations) and internal biological time.26 A large proportion of the population have social schedules that interfere with preferred sleep/wake schedules, and individuals with an endogenous chronotype at greatest divergence from the societally determined sleep and wake times are at greater risk of developing SJL; in other words, late types (‘owls’) display sleep/wake preferences that do not conform to usual, earlier daily work schedules (see figure 2). Consequences of chronotype and circadian misalignment. (A) The typical day favours a morning orientated individual. A morning ‘lark’ displays psychological wellbeing as daily behavioural rhythms are aligned to the social work schedule. (B) Evening orientated individuals are likely to experience more sleep debt and circadian misalignment due to social/work schedules. The resultant misalignment may have various negative health and behavioural outcomes. BMI, body mass index; MDD, major depressive disorder; T2DM, type 2 diabetes; MetS, metabolic syndrome. Given that the daily rhythmic expression of many vital homeostatic functions (feeding, activity and rest, body temperature, hormone secretion, cardiac function, innate immunity, neurophysiology) are driven by the endogenous biological clock,27 it is perhaps not surprising that disruption of these rhythms is associated with negative health and behavioural outcomes.23 There is an emerging understanding of the role of circadian clocks in many disease processes, and below we highlight evidence for the role of clocks in the aetiology, symptomatology and treatment of psychiatric conditions and metabolic disorders. From a further chronotherapeutic perspective, underlying circadian phase may also modulate the efficacy of antidepressant pharmacotherapy: recent research has demonstrated that evening types report lower SSRI (selective serotonin reuptake inhibitor) efficacy and more depressive symptoms during SSRI treatment,39 while a phase-delay after initiation of fluoxetine treatment predicted poorer treatment response in females.40 There are currently no evidence-based guidelines for the time of dosing for various SSRI antidepressants, although animal studies indicate that fluoxetine can alter timing in the master clock of the SCN.41 The antidepressant agomelatine is a mixed melatonin receptor agonist and 5HT-2C receptor antagonist with a putative primary mode of action through the circadian system and similar efficacy to SSRIs,42 a finding that further points to the potential clinical utility of targeting the circadian system for treatment of mood disorders. Circadian factors are also associated with subclinical depressive symptoms. A recent meta-analysis identified that evening-orientation is associated with more severe mood symptoms.43 A similar finding was demonstrated between evening orientated individuals and depressive symptoms in more recent research and poor sleep quality may mediate this relationship.44 In an adolescent population, evening types demonstrated more depressive symptoms and a higher prevalence of depressogenic cognitions.45 The impact of chronotype on symptoms of depression may be mediated through SJL, as adolescents and younger adults with later chronotypes experience greater levels of SJL, which in turn is associated with depressive symptoms.46 However, analysis of a patient sample with MDD and healthy controls found no association between SJL and depressive symptoms in either sample when the analysis was stratified.47 As SJL is a function of both intrinsic chronobiology and social factors such as employment status, and such factors are culturally-determined and also heavily influenced by age, further study in diverse populations is required. Circadian disruptions and alterations in circadian parameters have been reported in patients with bipolar disorder (BD). A recent systematic review reports phase delays in daily cortisol and melatonin rhythms, and depression (more so than during euthymia) was associated with circadian disruption.54 Interestingly, some studies showed more sleep/social rhythm dysregulation in BD than MDD.55 It has long been recognised that alterations in circadian timing, for example as a result of jetlag, can precipitate mood cycling in BD,56 and a recent study has demonstrated that in rapidly cycling BD, sleep/wake cycles appear to synchronise to the lunar cycle through an unknown mechanism.57 From a chronotherapy perspective, mood stabilisers such as lithium are known to impact directly on the core molecular clockworks;58 further, chronotherapy involving bright light therapy in combination with sleep deprivation has been shown to elicit a rapid and long-lasting amelioration of bipolar depression.59–61 From a mechanistic perspective, a number of cellular and molecular processes have been identified to interact with the clock and modulate mood, including hypothalamic-pituitary-adrenal axis function, immune and neuroimmune processes, neurogenesis and direct control of neurotransmitter and neuromodulator systems.62 Circadian changes have also been described in a number of other psychiatric conditions, including schizophrenia,63 attention deficit hyperactivity disorder,64 obsessive compulsive disorder65 and borderline personality disorder.66 As such, circadian processes appear to be important transdiagnostic factors to consider in psychiatry and clinical psychology. It is clear that the endogenous circadian clock plays a crucial role in various aspects of health, with increasing evidence demonstrating the important roles of the clock in both disease risk and management. Further work is needed to incorporate the circadian concept into the core of medicine in order to maximise its potential for disease prevention and treatment. Circadian rhythms, and the rhythmic nature of the world, have emerged as key factors in health and well-being, with circadian misalignment and mistimed sleep being associated with various pathologies and risk of disorders. Major depressive disorder has been associated with a later chronotype which may act as a risk factor for developing depressive symptoms or also occur as a result of depressive symptoms. The use of bright light therapy to advance this phase may decrease depression severity and also improve existing treatment. The circadian system needs to be used further to reduce the burden of mood disorders. Research is accumulating for the independent role that social jetlag (SJL) and chronotype may play in metabolic health. SJL has been associated with higher body mass index, increased risk of type 2 diabetes and metabolic syndrome even when confounding variables are controlled for, while later chronotype has been associated with diabetes risk and management. Novel behavioural interventions to reduce SJL that promote having more regular schedules across the week may be simple yet important in both preventing and treating these metabolic diseases. What is the nature of the relationship between the circadian system and mood disorders? Is the relationship between depressive symptoms and chronotype due to evening orientation or does social jetlag (SJL) mediate this relationship? As such, what chronotherapeutic approach could be used or would a simple behavioural intervention be of use to reduce symptoms? How beneficial will simple novel behavioural interventions to reduce SJL be for decreasing the risk of developing various metabolic disorders as well as treating them? 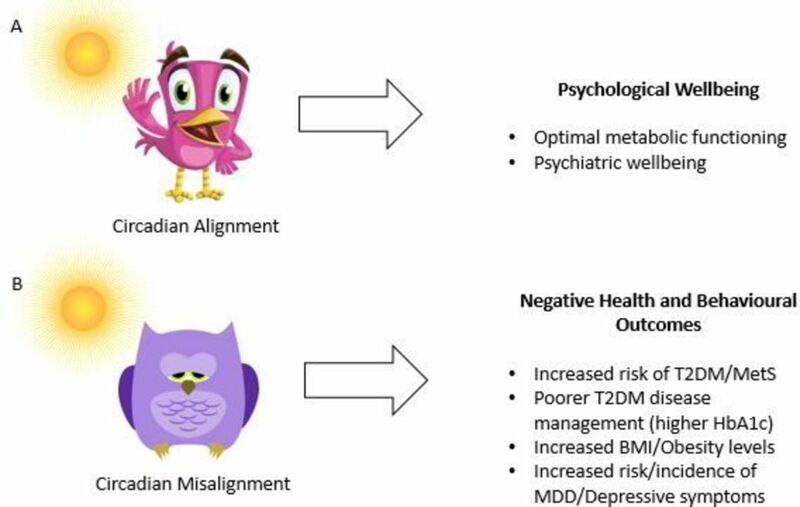 What is the causal relationship between chronotype and both mood disorders and metabolic dysfunction? Roenneberg T, Allebrandt KV, Merrow M, et al. Social jetlag and obesity. Curr Biol ﻿ 2012;22(10):939–43. Panda S. Circadian physiology of metabolism. Sci 2016;354:1008–15. Koopman AD, Rauh SP, van ‘t Riet E, et al. The association between social jetlag, the metabolic syndrome, and type 2 diabetes mellitus in the general population: the new Hoorn study. J Biol Rhythms 2017;32(4):359–68. Lyall LM, Wyse CA, Graham N, et al. Association of disrupted circadian rhythmicity with mood disorders, subjective wellbeing, and cognitive function: a cross-sectional study of 91 105 participants from the UK Biobank. Lancet Psychiatry 2018;5(6):507–14. Parsons MJ, Moffitt TE, Gregory AM, et al. Social jetlag, obesity and metabolic disorder: investigation in a cohort study Int J Obes 2015;39(5):842–48. The light-dark cycle is the strongest signal that entrains the circadian system? Morning orientation has been associated with more depressive symptoms? More circadian rhythm disruption has been observed in major depression than bipolar disorder? Severe circadian misalignment due to shift work has been associated with an increased risk of metabolic disease, however social jetlag has not? Later chronotype has been associated with higher HbA1c levels in type 2 diabetes?
. A two process model of sleep regulation. Hum Neurobiol 1982;1:195–204.
. Suprachiasmatic nucleus: the brain's circadian clock. Recent Prog Horm Res 1999;54:33–60.
. Diurnal variation of depressive symptoms. Dialogues Clin Neurosci 2008;10:337–43.
. Seasonal affective disorder. A description of the syndrome and preliminary findings with light therapy. Arch Gen Psychiatry 1984;41:72–80. Contributors RMK performed the literature search and selection with guidance and supervision from ANC. RMK and ANC wrote the paper and RK prepared the figures. UH, JHMcD and SS contributed to the content and revised the paper. All authors were involved in the manuscript drafting. All authors agree and approve of the final version of the manuscript. Author note All contributors met the criteria for authorship.